Setting up classroom spaces has always been one of my favorite things to do as a teacher. Now, as a consultant, I love helping other teachers think of fun and practical ideas for designing great learning spaces. 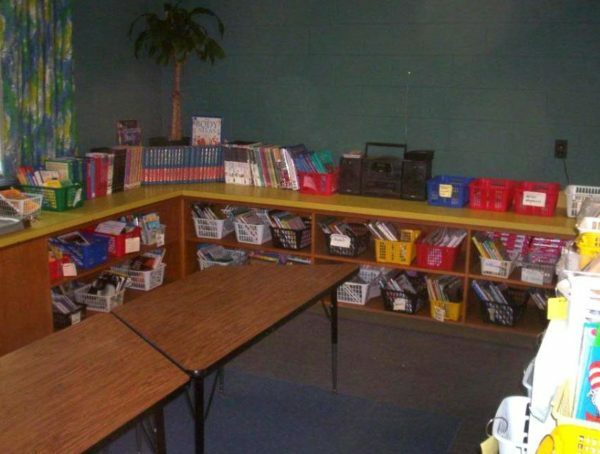 Last year, a brave teacher and I completely reworked her entire classroom while her students were at lunch and music. We rearranged all of the furniture (and got rid of quite a bit), cleaned up the walls, and reorganized supplies. Once her third graders returned and got over the shock, they handled things quite well and helped us finish things off! 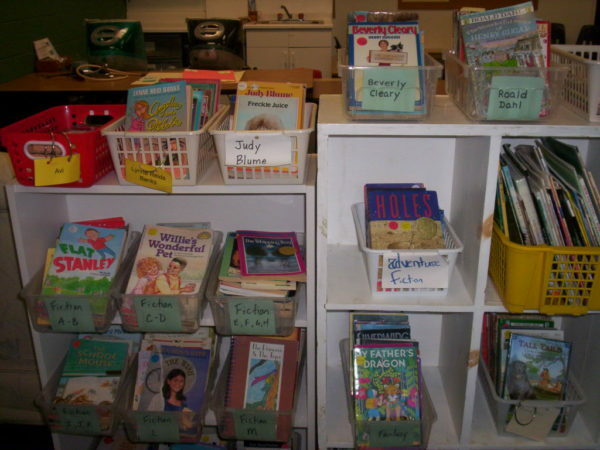 Books are organized by genre, author, series, or topic and placed in bins for easy access. Each bin is labeled and each book has a corresponding sticky dot that helps it get back in the right bin. After this picture was taken, I covered most of these books with large pieces of paper labeled “Coming attractions!” and “Opening soon!” so our library wouldn’t be overwhelming during the first few weeks. Every few days, we would unveil another section of the library, slowly discovering the books together. This helped students learn how to choose “just right” books and practice using the organization of the library slowly, while also building excitement and anticipation. The table that you see in the middle of the library is a regular work space for students. You’ll notice, as you look through these photos, that work spaces are spread out in the room. Putting 20 ten year-olds all together in the middle of the room makes for a loud class, so I try to keep tables far apart. 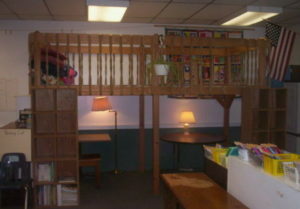 Near the library is a loft and a set of cubbies. The cubbies were where students kept their supplies (reading books, writing journal, science notebook, snacks, etc.). Since we all work together and partners and groups shift throughout the day, I didn’t assign go-to seats. 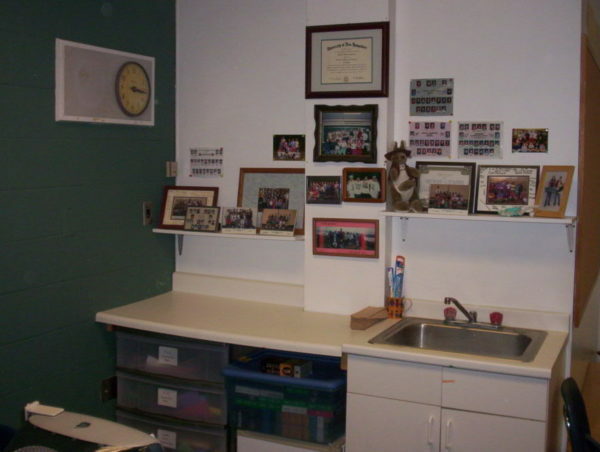 The cubbies gave everyone a spot to keep daily work so they could move around the room easily. The loft is a simple structure, which I built as a free-standing deck. There are hooks to hang a ladder so it’s easy to close the loft when it’s not in use. (Since I know you’re wondering…no, the fire marshal did not like this loft, and no, he didn’t make me get rid of it.) Eight students can be in the loft area comfortably (four above and four below), making the rest of the room feel quite spacious. 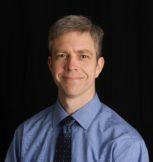 A rotating schedule at the beginning of the year gives everyone an equal chance to work in the loft and eliminates first-come-first-serve mad dashes for the ladder. As I write about in Learning to Choose, Choosing to Learn, shared supplies can help support equity in a classroom. When all students have access to the same high-quality supplies, there’s a feeling of fairness in the room that help supports a positive community. In my classroom, students weren’t allowed to bring in special supplies that only they and their three best friends could use. 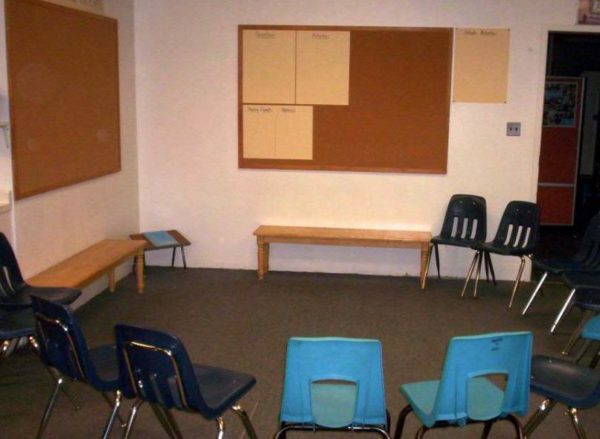 Any supply or material in the room was available to all. This old card-catalogue file drawer set (that our school was about to throw away one year) houses pens, pencils, rulers, markers, colored pencils, glue sticks, and other daily supplies. Other supplies are kept in a few other locations around the room. Notice the white set of cubbies nearby; keeping student cubbies spread apart helps smooth transitions to get (or put away) materials. and charts for games and activities! The benches in this circle, donated by a family one year, helped cut down on the size of the space. When not in use by the whole class, students often liked to sit on the floor in the circle area to do work. Here’s another student work space. Several students can fit at these tables while several more can sit on the couch (which was also donated by a family one year). Just off to the left of this space is a round table where student can work. That table was easy to move, so we could be flexible with its location. 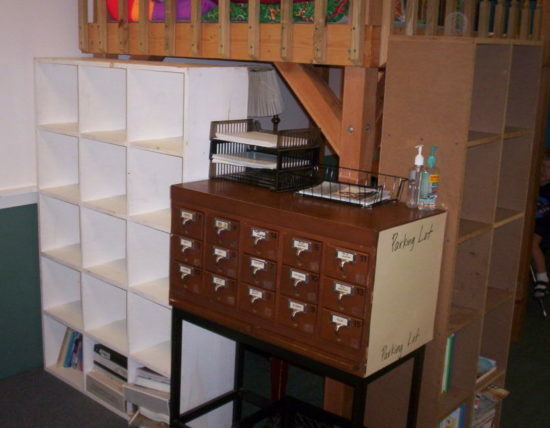 The storage bins in this picture hold frequently used math supplies (calculators, dice, cards, protractors, compasses, multiplication charts, etc.). Like the book shelves, these are about to be covered up until they are introduced. Tucked away in this corner was one of my teacher storage spaces. There are a few supplies that we’d use later in the year and a small counter where I could place my work. This space wasn’t a student work space, though students would often drift over during a free moment to peruse the class pictures from former years. My other main storage space was located behind the loft.That was where I kept files, off-limit supplies, and boxes of books that were being saved for later in the year. 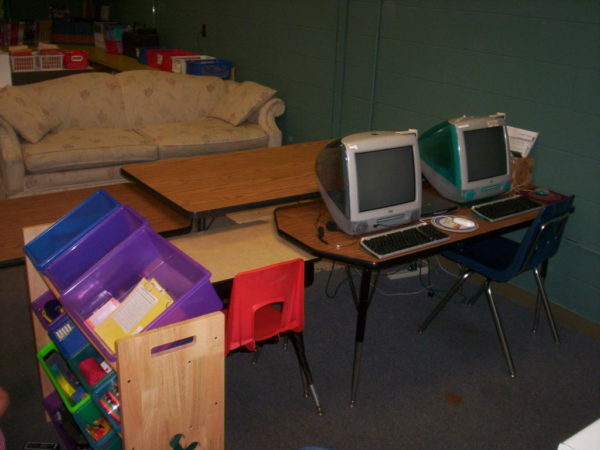 I did not have a teacher desk in my classroom. I found out years ago that it took up too much space. I never sat there anyway since I’m always up working with students. 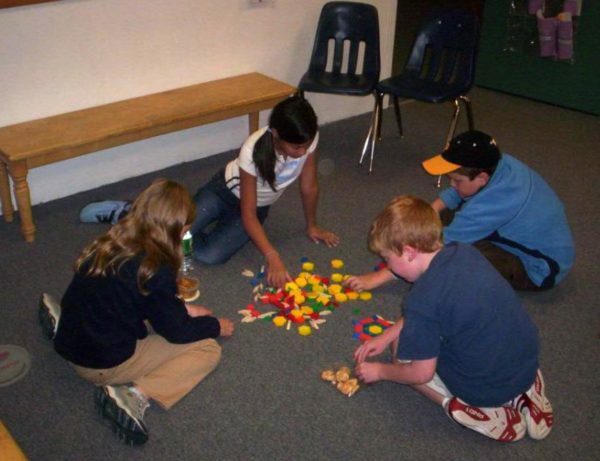 Here are links to some other resources that might inspire your classroom design thinking! I hope you’ve enjoyed this little photo walk. Feel free to reach to me with any questions and comments!